8% of all gold consumption is estimated to go to central banks annually. Recent purchases and repatriation moves have gathered a lot of news coverage but what is the thinking behind such policy and should we expect to see more? Speaking at a precious metals seminar held by the London Metals Exchange, Dr Jonathan Butler of the Mitsubishi Corporation RtM, explained an increase in central bank gold holdings had to be viewed in relation to the context of the US dollar and the potential politicising of its hegemony as the world’s reserve currency. “We’re in a period of dollar strength at the moment, which is negatively effecting gold in one sense but there are certain countries in the world that want to diversify their own domestic holdings away from the dollar towards other assets, including gold. We’ve seen that in China – we’ve seen it more recently in countries like Poland.” Hungary has now joined that movement, increasing its gold reserves ten-fold earlier this month. The competition of currencies has been framed by developments such as the opening of the Shanghai oil exchange futures contract and its facilitation of oil purchases in renminbi. Likewise, Russia and the EU have been in discussion about subverting dollar payments for energy by making payment in euros. “It is absurd that Europe pays for 80% of its energy import bill — worth €300 billion a year — in US dollars,” European Commission president Jean-Claude Juncker recently said in his state of the EU address. 1 ) The debt is inflated away – “in itself a gold supportive thing”. 2) Debt is ignored while the US dollar continues to enjoy its status as the world’s reserve currency. 3) Confidence in the dollar is eroded to such an extent that there is a crisis of faith in it as a store of value. Poland recently made a significant purchase of gold, while China, Russia and India have made massive additions to their gold reserves, continuing a trend that started before 2018 and which seems to suggest that some central banks see gold as undervalued. 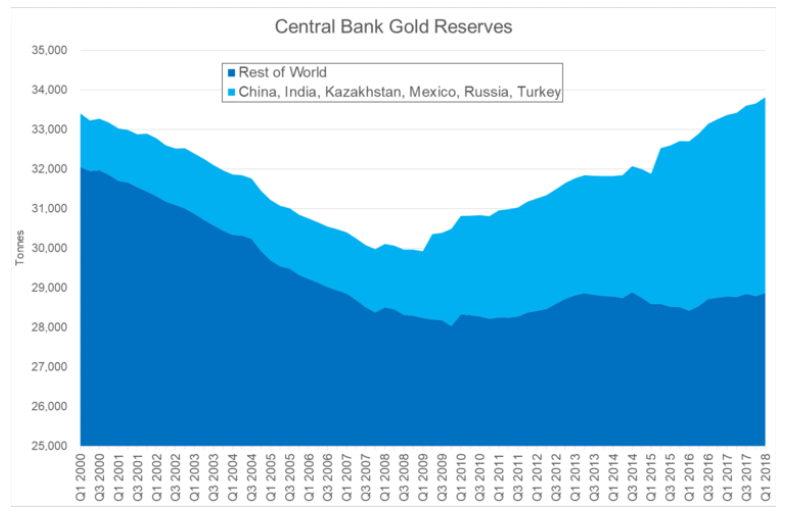 The last 18 months has also seen a number of central banks repatriate their gold reserves. Notably Germany, Turkey and Hungary. The use of the dollar as the most popular reserve currency was also questioned by the World Gold Council’s lead economist John Reade. Who pointed to what he believed to be Washington’s hubris of “weaponizing” the dollar’s hegemony by seeking to limit payments via the global SWIFT system and the pursuit of sanctions against Iran and trade quotas against China.